Watch the video “Wireless speed wheel features and setup.” Note This video is available in English only. The easiest way to install the Xbox 360 Wireless Speed Wheel software drivers is to connect to Xbox Live. If your console is connected to Xbox Live, then you’re ready for Step 2. Insert the Software Driver disc or the game disc included with the Xbox 360 Wireless Speed Wheel. When you’re prompted to update your console, choose to update the software (if you aren’t prompted, the software is up to date). Once updated, go to step 2. Update your console software. Once updated, you’re ready for step 2. Turn the speed wheel upside down. Press the battery release button to open the battery door. Insert two new AA (LR6) batteries with their positive (+) and negative (–) ends positioned as shown on the battery compartment. For best performance, AA rechargeable batteries are not recommended. Replace the battery door and push to lock in place. Note The wireless speed wheel doesn’t charge rechargeable batteries. You must recharge batteries in a charging device. Press and hold the Start or Guide button on the wheel until lights flash. Within 20 seconds, press and release the connect button on the wireless speed wheel. The light on the wheel’s right handle will flash while it connects to your console. Once the wheel is connected to your console, one segment on the wheel’s center ring of light is illuminated (this can take up to 10 seconds). The Xbox 360 Wireless Speed Wheel has buttons, lights, and triggers, on the handle bars and in the center of the speed wheel. The controls in the center of the speed wheel include the Start, Back, and the Guide button. A light ring surrounds the Guide button. When you connect the speed wheel to your console, a section on the ring of light illuminates. Each subsequent speed wheel or controller that is connected to the console (up to four) is assigned a section on the ring of light. Start and Back button behavior is the same as on your Xbox controller. Press the Guide button to turn your console on. Once on, pressing the Guide button displays the Xbox Guide. 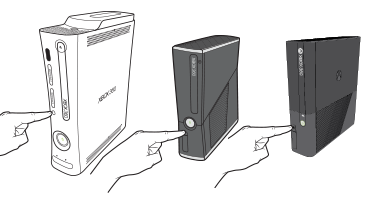 To turn off your console, press and hold the Guide button for three seconds and confirm your selection. The controls on the handle bar include the accelerator trigger, the brake trigger, and the A, B, X, and Y buttons. Squeezing the accelerator trigger on the right handle bar makes your vehicle go faster. Squeezing the brake trigger on the left handle bar makes your vehicle slow down. The A, B, X, and Y buttons behave the same as on your Xbox controller. The directional pad behaves the same as on your Xbox controller. When you use your speed wheel with driving games, it acts like a steering wheel and ignores unwanted motion. The speed wheel supports pitch, yaw, and roll, but not all games supports these actions. Refer to the game’s manual to find out what actions are supported by the game. Wait for the wheel to be assigned a section on the ring of light. The wheel is ready to play. If lights continue to flash around the Guide button, see the Setup or Troubleshoot speed wheel problems topics on this page. Watch the video “Using the speed wheel with racing games.” Note This video is available in English only. The Xbox 360 Wireless Speed Wheel is designed to work with most Xbox racing games. Because the wheel does not have shoulder buttons, some functionality may be limited in some game titles that use shoulder buttons. Refer to the game’s manual for information about shoulder button functionality, or to see if the game allows remapping of controller functions. Watch the video “Playing Forza 4 with the speed wheel.” Note This video is available in English only. Make sure the batteries are new AA alkaline or fully charged Nickel Metal Hydride (NiMH) rechargeable batteries. See Setup for more information. When four lights around the Guide button flash followed by alternating flashing, this means the wheel is not connected to the console. If this is your first time connecting the wheel to your console, refer to the Setup information above. The wheel should stop flashing and be assigned a section on the ring of light. Move the speed wheel closer to the console. Make sure the console and speed wheel are at least three feet away from large metal objects, such as file cabinets and refrigerators. Metallic decorations or stickers on the console or speed wheel can interfere with performance. Remove decorations and try connecting again. Make sure the front of the console is positioned in the direction of the racing wheel, and not toward a nearby wall. Cordless phones (2.4 GHz), wireless LANs, wireless video transmitters, microwave ovens, and some cell phones can interfere with the operation of the speed wheel. Try turning these wireless devices off or unplugging them, to see if the wheel will then successfully connect to your console. Would you like to contact Support regarding the "Xbox 360 Wireless Speed Wheel" issue you were reading about or a different issue?